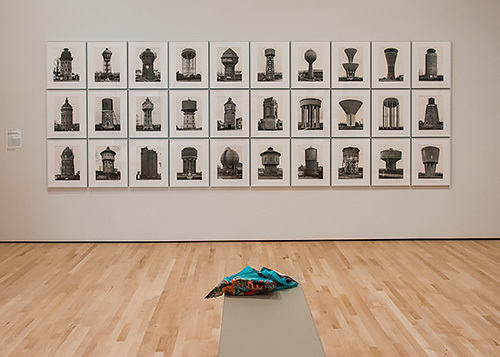 There were only a couple hundred of us touring the entire museum last week during the SFMOMA press tour so there wasn't a lot of people in any one room at the same time. After a couple of trips to see Bouquets to Art, we welcomed the change. But the rooms weren't empty. Another member of the press or two could usually be seen, often photographing a work of art undisturbed or making notes. In a couple of cases, they turned out to be assistants for shots that put a smile on our face. Near the end of our visit, we wandered into a gallery full of Bechers. There were two other people in there, pointing things out to each other. The Scarf. When art becomes art. But as we turned around from the set we were enjoying, we saw they had moved across the room, leaving a colorful scarf taunting the industrial images on the wall from the end of a bench. We just happened to be lined up perfectly for the shot, a real gift. We had been shooting at a small aperture with the ISO allowed to roam as high as 1600 and with image stabilization on. That let us get both the scarf in the middle ground and the Becher set in the background in focus. 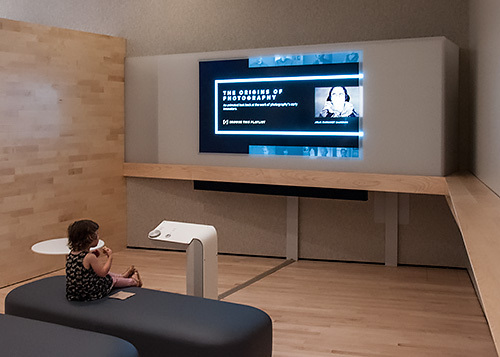 As we toured the new Interpretive Photo Gallery, we just happened to enter the video presentation area as a very young girl (the one who sat next to us very quietly through the speeches on her mother's lap) watched The Origins of Photography. Julia Margaret Cameron, appropriately, is on the screen. Origins. When education becomes art. The video presumably made an effective temporary babysitter as her mother picked up a snack a few feet away at the cafe. We grabbed the shot before anyone else saw her, using the same setup as the image above. But right after, a museum employee whipped out his smartphone to take the same photo. Our post processing was done in Adobe Camera Raw and Photoshop CC. We weren't worried about noise because it disappears in these 500-pixel images. We focused on white balance, exposure and detail. Both images needed the Upright tool to eliminate lens distortions. We're still amazed at how useful this has been, considering how new it is. We also needed to punch up small areas of both images. We increased the saturation of the scarf slightly and used a custom Curve on the screen image of Julia Margaret Cameron. Just two shots. But worth a second look. And a little work.